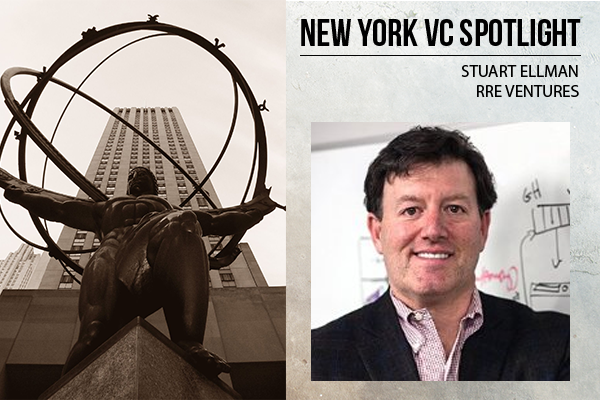 Stuart Ellman has accomplished many things in the 25 years since he graduated college, including cofounding RRE Ventures, one of the largest early-stage venture capital and investment firms in New York City. In the nearly two decades since its founding, RRE Ventures has raised 5 funds, invested in over 200 companies and manages over $1 billion. Ellman has also been personally responsible for over forty technology investments during that time. Ellman holds a BA in economics from Wesleyan University, where he was a Gilbert Clee Scholar and a Horace White Fellow. As a Clee Scholar, Ellman got his start in the investment world early on when he worked with McKinsey & Company in the management consulting area during the summer between his junior and senior year of college. After graduating from Wesleyan in 1988, Ellman worked as a financial analyst at Dillon, Read & Co. before going back to school and earning an MBA with Distinction from Harvard University in 1992. While earning his second degree, Ellman interned at Morgan Stanley, working in the area of fixed income capital markets. Prior to founding RRE Ventures, Ellman was the junior co-founder and vice president at Advisory Capital Partners, a principal investment and advisory firm. At the same time, he co-founded InterVideo Response along with Jim Robinson IV — one of his friends and classmates from Harvard. InterVideo Response — founded in early 1994 — attempted to build in-stadium touchscreen ordering systems. InterVideo Response did not live up to their business expectations and in the second half of that same year, Ellman and Robinson co-founded RRE Ventures. Aside from his work at RRE Ventures, Ellman has served on the board of 92nd Street Y, a non-profit community and Jewish cultural organization, since 2001. For the last eleven years, he has taught a seminar in venture capital at Columbia Business School, where he works as an adjunct associate professor. He is also a member of the New York City Investment Fund’s Clean Tech Sector Group, the VC Advisory Group of the New York City Economic Development Corporation and the Economic Club of New York. He is on the board of the Browning School, serves on the President’s Council at Wesleyan University and serves as a mentor for TechStars. Information Technology (Security, Green IT, Consumer-Facing Web Companies, Enterprise Software), Management, Business Strategy, Mobile, Entrepreneurship. Venture Capital, Corporate Development, E-Commerce, Entrepreneurship, Mergers & Acquisitions, Product Development, Restructuring, Startups, Strategy.